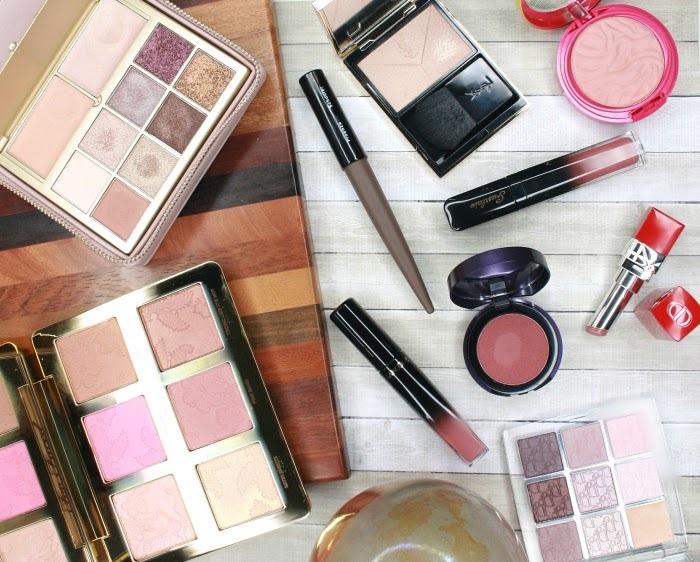 One of the biggest makeup trends this summer is bold and daring. 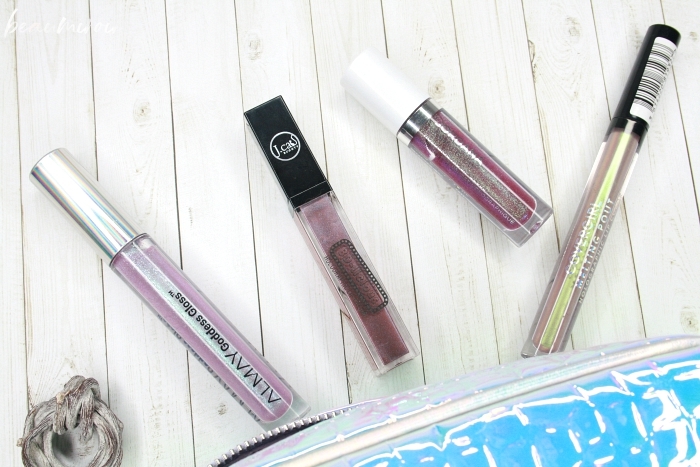 Most brands call it holographic, others prismatic or duochrome, but it's all about the special effect lip gloss. 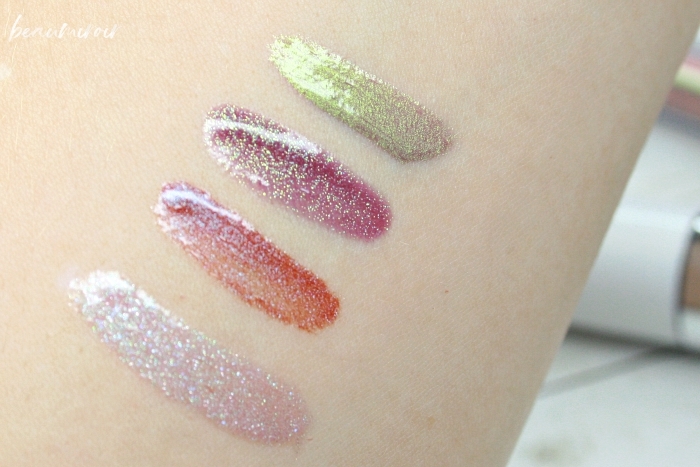 With dazzling glitter, a metallic shine or a color shift, they transform your lips in one swipe! If you're tempted to try this trend there are lots of options at all price points. 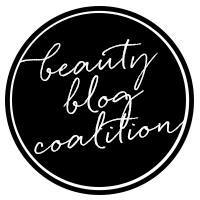 Today I will show you 4 holographic lip glosses available at the drugstore that I've personally tested, plus a ton of others to choose from! The "holo" craze started years ago with nail polish: every brand was competing to make the most mesmerizing polish with those reflective rainbow particles. The trend then invaded the makeup world with eyeshadows, eyeliners and now lip glosses claiming to be holographic. 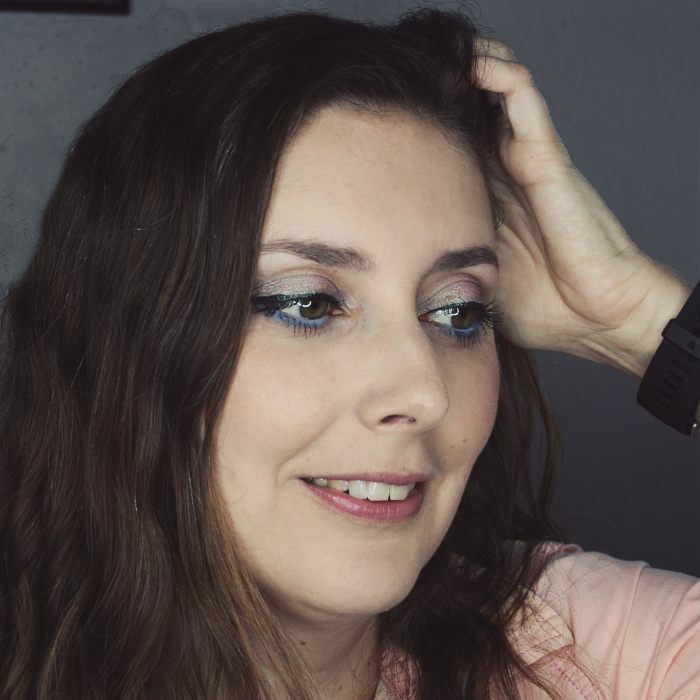 Strictly speaking, most of those makeup products are not actually holographic, they would be best described as duochrome or prismatic (I recommend watching this video featuring Youtuber Simply Nailogical to understand the difference), but they're still so tempting! I got the CoverGirl Melting Pout it in 700 Revelry and this is no doubt the most daring lip gloss in my little selection! It's a metallic gloss with a mirror-like finish and a mauve-y beige base with a strong lime green shift. 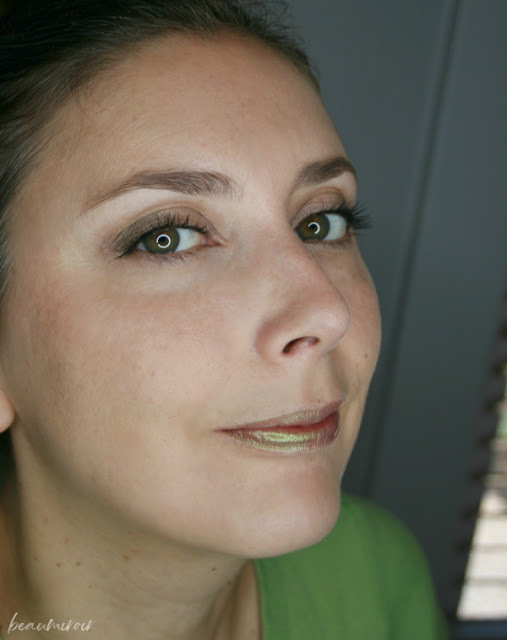 It's fun, but the duochrome is so strong that my lips end up looking plain metallic green. Not exactly an everyday kind of color! The packaging is also a little odd: it's a very long and narrow tube, so the doe-foot applicator is at end of a loooong plastic stick. Not the most maneuverable if you ask me! On the bright side, the formula is really opaque and smooth, so you won't have any issues with streaky application. It also feels nice and comfortable on the lips. The 3D-Licious in Eternal Chaos is my first ever product from J.Cat Beauty and I'm quite impressed with my purchase. It feels really hydrating and cushy on the lips but it's not heavy or tacky at all. It's also a duochrome with a deep metallic berry base and a blue shift. What I like about this one is that I can apply it lightly for a more subtle effect. It's still cool and unique, but it's a lot more wearable! I feel like I don't get much gloss on the applicator so I have to re-dip at least once, even when I'm doing a very sheer layer. But other than that I think it's a nice subdued version of the holo lips trend! I bought this Jordana Cosmic Glow in Iridescent Purple and I couldn't be happier with the color! 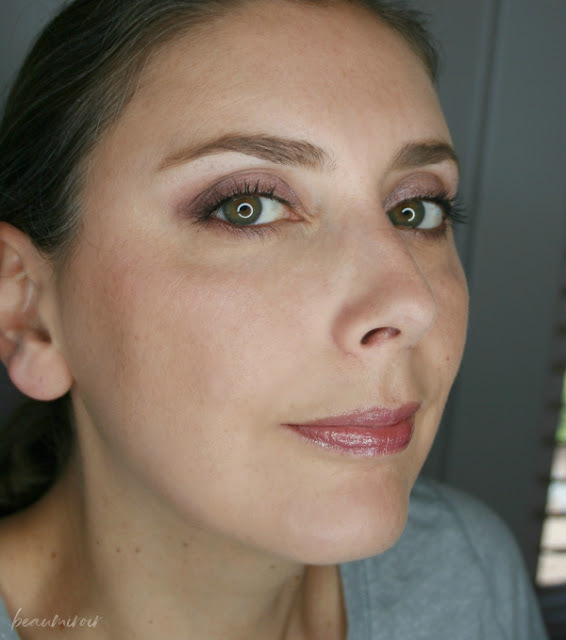 It's a deep plummy purple semi-sheer gloss with micro shimmer that shifts from blue to green. This one is also quite wearable but it adds a lot of dimension to the lips with the pretty shimmer. It's perfect for me for summer evenings! I'm also impressed by the comfortable non-sticky formula that smells like vanilla and the convenient curvy applicator. Quite amazing for a $5 lip gloss! Wearing Jordana Cosmic Gloss in Iridescent Purple: the photo doesn't do it justice! The Goddess Gloss is part of Almay's Cosmic Collection that also includes holographic eyeshadows (I kind of want to try that!). I bought it in Mystic, a glittery light blue-based lilac. This one is quite sheer, and being also light it doesn't have quite as much impact as the others. It's more of a translucent sparkly gloss, so I think it's best used as a lip topper over a lipstick to add dimension. The sparkles are pretty long-wearing, they're still visible on my lips even after all the glossiness is gone! How do you feel about the holo lips trend? Is this a look you would wear?